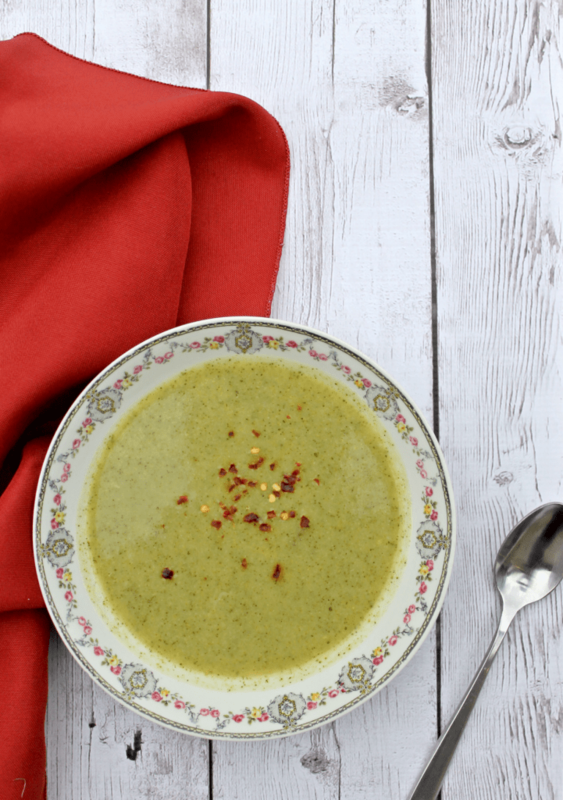 By making broccoli soup in the Instant Pot, you can have a flavorful comfort food without any of the guilt (and in a fraction of the time!). 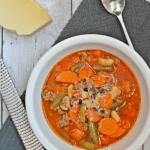 This delicious pressure cooker soup is Whole30 friendly and a healthy meal that is ready in no time! Upon hearing the knock at the door, I picked up my toddler and went to answer it. When I opened the door, there she stood, slightly hurried but with the same familiar and warm smile I’d come to know and love. My sweet friend quickly handed me a container of soup from her refrigerator, along with a few other items, before saying her goodbyes and heading down the steps with her suitcase. For more than a decade, my husband and I lived in a 1940s building that housed three separate apartments in a lovely historic neighborhood in Nashville. The top apartment was home to our dear friend Patsy, who lived most of the year in Paris, France, but would come to Nashville a few times a year, usually staying for a few weeks at a time. Whenever the time came for her to fly back to Paris, she would often bring us leftover goodies that she didn’t want to throw away. Hence, the parting gift of soup. 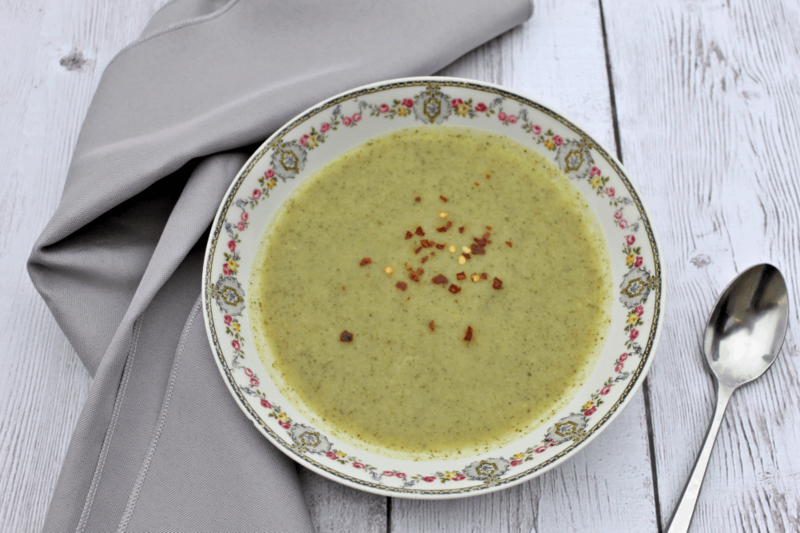 But it wasn’t just any soup–it was homemade broccoli soup. And it was delicious. 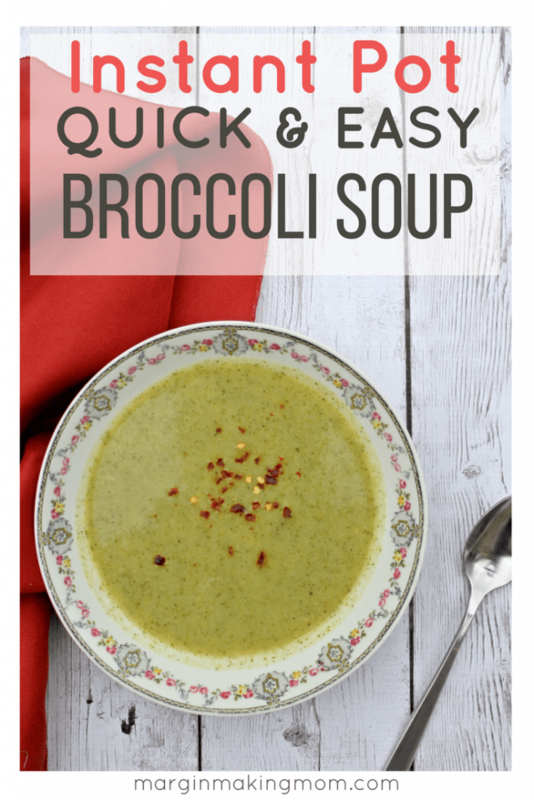 I admit, I’d never had plain broccoli soup before. Broccoli potato soup, yes. Broccoli cheese soup, of course. But never just broccoli soup. So that evening, I popped open the container and warmed up some of Patsy’s broccoli soup. My daughter, who was probably only one year old at the time and wasn’t extremely fond of vegetables, gobbled it up and asked for more. Naturally, I asked Patsy for the recipe and she graciously obliged. 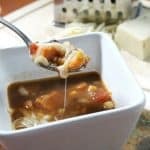 It’s written on a yellow scrap of paper and, while the ingredients are extremely simple, the soup is delightful. 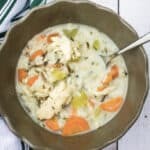 Patsy’s recipe uses a traditional stove top method of preparation, but when I recently made the soup again, I opted to use my Instant Pot to save a little time. It worked like a charm! First, you saute some onions in some olive oil using the Saute function of the Instant Pot. Once they’re beginning to soften and turn translucent, throw in your chopped broccoli and add in the broth. Lock the lid in place and set a cook time of 3 minutes. When the cook time is complete, you can perform a quick release of pressure. Use your immersion blender to get it to the consistency you prefer, then add in some salt and pepper to taste. 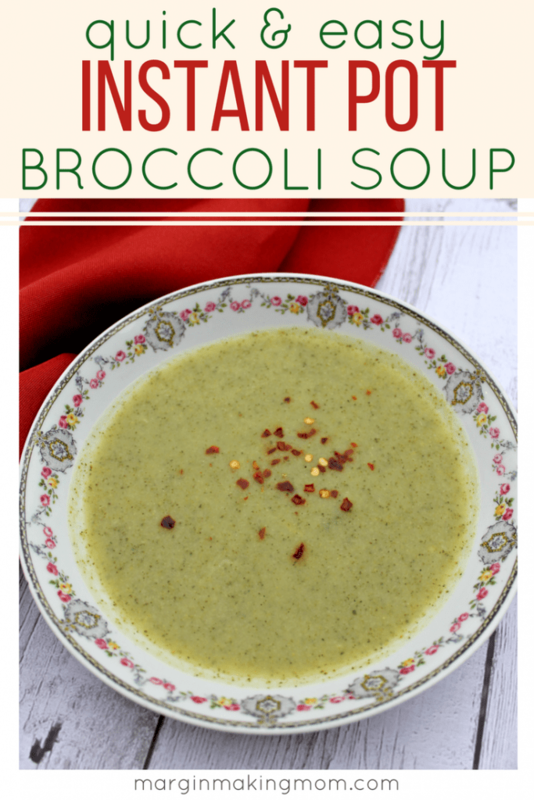 This Instant Pot broccoli soup is delicious as-is, but you can top it with a sprinkling of red pepper flakes or even some shredded cheese. I served mine alongside warm and gooey grilled cheese sandwiches. Delightful! 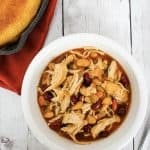 You can learn more about making easy pressure cooker recipes (including a getting started guide) here! You can also scroll down to get my FREE guide to getting started with your pressure cooker! If you need a bit more help conquering the learning curve of the pressure cooker, I recommend checking out Electric Pressure Cooking 101. In the insert pot of an Instant Pot, add olive oil and onions. Use the Saute function to cook the onions until they begin to turn translucent and soften. Add broccoli and chicken broth to the insert pot. Press Cancel/Keep Warm to turn off the Saute function. Twist the lid into place and set the vent to the sealed position. Select the Manual/Pressure Cook function and a 3 minute cook time at high pressure. When cook time is complete, perform a quick release of pressure by carefully turning the vent to the open position. When pressure has released and the valve has dropped, carefully remove the lid. 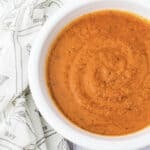 Use an immersion blender to puree contents to your desired consistency. Add salt and pepper to taste. If desired, add a pinch or two of cayenne pepper or red pepper flakes. 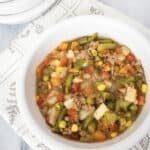 If you don't have an Instant Pot, you can prepare this on the stove top. In a stockpot, cook onions in oil over medium-high heat until soft and translucent. Add broccoli and broth and bring to a boil. Cover and cook until broccoli is tender. Use immersion blender to achieve desired consistency. Add salt and pepper to taste. If desired, add a pinch or two of cayenne pepper or red pepper flakes.